Skerries Historical Society | Promoting awareness of and conservation of local history, heritage and artefacts. Membership is open to anyone with an interest in local history and the annual membership fee is €10. If you would like to become a member please print the membership form fill it in, and give it to any member of the committee, or bring it along to one of the meetings. Next Meeting – Tuesday 9th April 2019 at 8.15 p.m. The talk sketches the relations between Ireland and Rome from the Conversion to the 11th and 12th century. Church Island had a link with St. Patrick in the earliest texts about him. The talk covers the dispute about calculating the date of Easter, pilgrimage, and the occasional piece hard evidence of direct Roman influence in Ireland. It closes with the reform of the Irish Church in the 12th century. A synod on Church Island sent a delegation led by Malachy, Bishop of Armagh, to seek from the Pope the Pallia – the insignia of archbishops newly designated by the reforming synods. Malachy was a friend of Bernard of Clairvaux in whose abbey he stayed on his last journey to Rome but he died there. Bernard paid a tribute to his friend at his burial. Bernard also wrote a Life of Malachy. But there was a sting in the tale. In order to show Malachy’s saintliness he described the disgusting depravity of the Irish and his battle against sin, abuses and barbarity. It impressed the future Pope Adrian to issue a bull which offered Ireland to anyone who would invade and clean the place up. It was used a little later to justify the Anglo-Norman invasion. Annual Membership fee for season 2018/19 now due. The Annual Membership fee of €10 for season 2018/19 is now due, if you have already paid thank you. Members can re-new at any of our monthly meetings or online here. 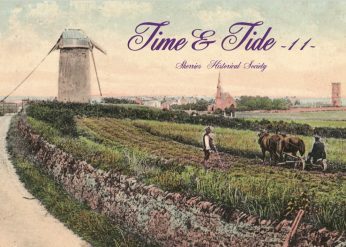 Time & Tide, Volume 11, published October 2018, contains a collection of papers from our archive. The papers chosen include oral history from the early 20th century, Milverton School, Balrothery Workhouse, the Easter Rising and the revolutionary period, maritime history, histories of Holmpatrick and Holmpatrick Church, a story from the Second World War, and a short history of Skerries Tidy Towns. Time & Tide can be purchased online by clicking here. It is also available in several local shops. Skerries Mills, Skerries Bookshop and Greg Reddins. with Geraldine Clarke, Bill Kee and Pauline Hanlon.